from What Good is a Life List? I grew up in coastal Southern California, where frost on the grass was a novelty, and where for a winter treat people would drive to the mountains to see the snow. Kids would pack the white stuff onto the car's hood and bumpers and hope to get back before it all melted so they could show their friends. This sort of history stays with a person, and maybe it's the reason that even though I now live in Iowa, I still think winter is fun, and the deeper the snow, the better. So when I got a chance to join a group of Iowa birdwatchers who were going to Minnesota for four days of winter birding, I happily met them before dawn on a frozen morning and headed toward Duluth, beside myself with anticipation about finding the wonderful birds that can be seen only in the far north during winter. Snowy Owls, for example, come south in winter from the Arctic tundra, the treeless land between the polar ice and the great boreal forest of Canada and Alaska. But Snowy Owls seldom get to Iowa. The closest place that an Iowan can count on seeing them is Minnesota, and even there only in winter. For years I had been longing to see a Snowy Owl. But that was not my only target. I'd made a list of potential "life birds," birds I'd never seen anywhere before but hoped to find in Minnesota. Sometimes people ask me why I want to see a bird I've never seen before, if it's an acquisitive impulse, or perhaps a competitive urge. I don't think it's quite like that. For me, each bird is the embodiment of the land in which it lives, an ambassador of its home and habitat. Seeing a bird that lives in a special place, I feel as if I've met the spirit of that place and made friends with it. 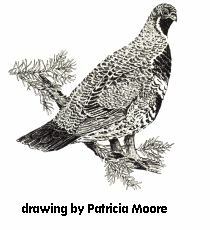 At the top of my Minnesota wish list was the Spruce Grouse, a chicken-like bird that lives in the remote coniferous forests of the far north. In contrast to Snowy Owls, Spruce Grouse do not migrate. Most of them stay in the same area all their lives. The few individuals who do travel move no more than ten miles from where they spend the winter to their summer home, and they cover that distance by walking! This is a bird that will never wander into your backyard. To see it, you have to go to its stronghold. Spruce Grouse pass the summer on the forest's mossy ground, eating snowberries, fern tips, and the occasional spider. In winter they stay up in the trees, where they fuel their body through the brutal winter exclusively by feeding on the needles of spruce and other conifers. The Spruce Grouse is good to eat, and because it does not fear people, it does not thrive around human habitation. It is so trusting that hunters have been able to walk up to it and bag it with a stick. None has ever been seen in Iowa. We had good luck in Minnesota. We did find a Snowy Owl, perched with its back to us on a tower at a power plant. Maybe the unobstructed view of the treeless, snow-covered landscape reminded the owl of its tundra home. To me it seemed as if the bird had brought the inaccessible Arctic with it, just far enough south that we could meet it. The big white owl pivoted its head around toward us, looked at us through half-closed yellow eyes for 20 seconds, and then turned its gaze to something else. It was a moment of contact. It was enough. By the third day we had found nearly all the birds that we'd come for, except for the Spruce Grouse. For that we had to leave the motel in Duluth long before daylight and drive almost to the Canadian border. As dawn came up, I found a new use for a credit card, shaving my frozen breath from the van windows in little slivers and curls of ice. Peeking out through the ephemeral clear places on the glass, I had my first glimpses of the great, silent North Woods of Minnesota. Spruces, firs, and other evergreens thickly engulfed us. Great looping branches draped our views, and all were loaded with snow, drenched in white. It was a frozen Forest Primeval, and it made me feel as if I were moving in a Nordic myth. We'd been advised that the best time to find the grouse was before 9 A.M. It's also the only time to avoid the traffic. This forest is intensively logged, and throughout the day logging trucks dominate the narrow, icy roads. We hoped we would find the birds before the logging trucks were about. These roads are an excellent place to see Spruce Grouse, because of the gravel. Lacking teeth, the grouse, like many other birds, eat small rocks, which lodge in their gizzard and grind around with the food to break it down. After each storm, when the roads are graded and sanded, the birds come for the grit. For hours we drove slowly back and forth in the region that the grouse were known to frequent, but to no avail. Soon the trucks woke up and came screaming down on us, shaking everything. It would seem there was no room for them to pass, but somehow, without ever slowing down, they got by us. Life in a rifle barrel. By mid morning the sun was shining at us sideways through every chink in the trees, and we were trying to get used to the idea that we might not find our grouse. But suddenly, around a bend, there was a male Spruce Grouse, right in the middle of the road. We pulled over to the side to make sure everyone got a look. We could see the bright red comb above his eye, and the gleaming black breast. We planned to get out and try for a closer look on foot as soon as everyone had seen as much as we could from inside the van. However, a logging truck came up from behind and roared, much too fast, toward the poor grouse. "Fly away!" we were all shouting, but the bird pecked at the road unconcernedly as the truck bore down on it and concealed it from our view. Someone groaned, "Oh no, there goes my life Spruce Grouse!" We watched with fascinated horror until it was clear there was no longer any chance for the bird to escapethe truck was too close to it, moving too fast. But in myths, impossible things happen, and somehow the bird was in the air above the truck, wings beating for the woods, tail spread in a beautiful black fan with a light band across the end like a ribbon. The field guides say this band is chestnut, but with the morning sun shining through it, I assure you, it was pure gold. Photo of the Spruce Grouse is by Ralph Lieske, who graciously allowed us to show it here. Click the photo for a bigger picture.